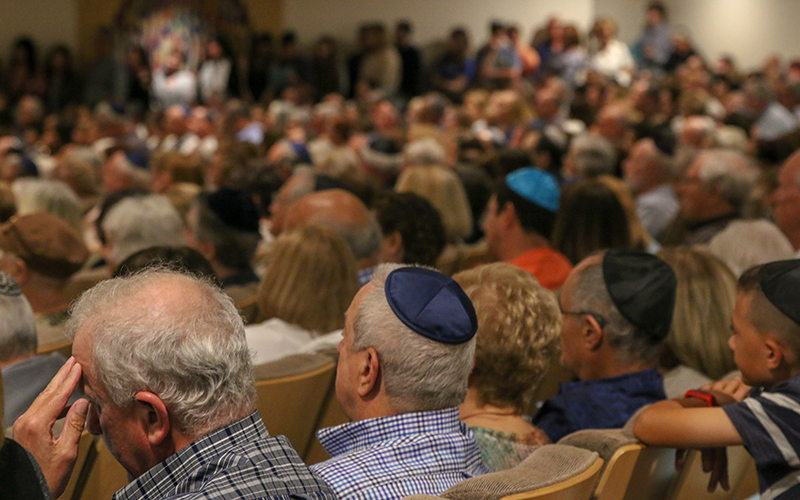 SCOTTSDALE – Standing against the walls, sitting in the aisles and crowding around the Goldsmith Sanctuary door to glimpse inside, hundreds of community members packed Congregation Beth Israel on Monday night. 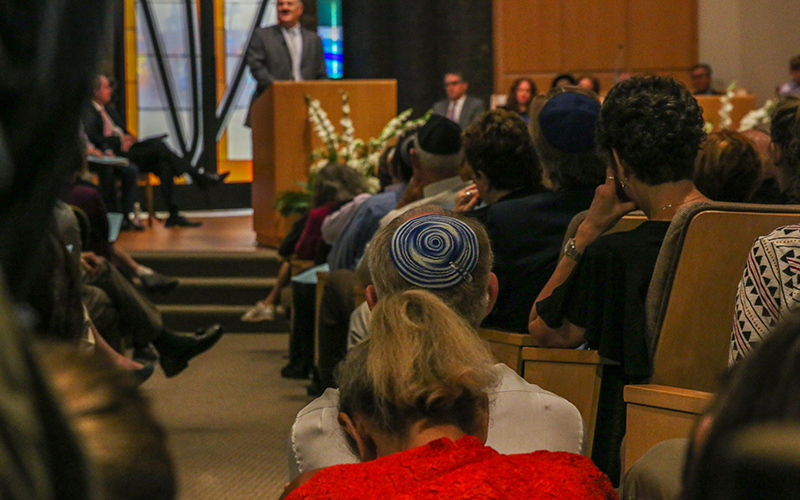 After reaching maximum capacity, staff directed attendees to additional seating in the lobby of the synagogue. 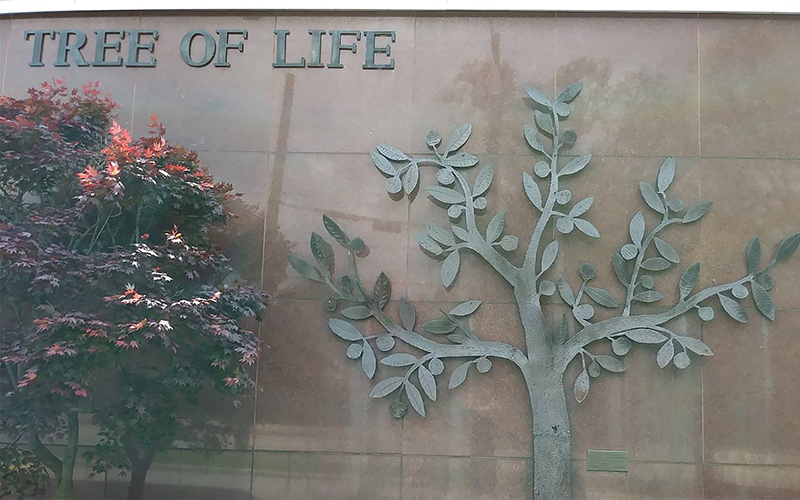 The service began with Rabbi Stephen Kahn welcoming the guests to Service of Hope, Healing and Peace – an opportunity to reflect on Saturday’s shooting at the Tree of Life Synagogue in the Squirrel Hill neighborhood of Pittsburgh. Eleven people were killed when a lone gunmen with multiple firearms entered the synagogue and opened fire. Witnesses said the gunman spouted anti-Semitic statements as he went room to room. The attack hits close for former Squirrel Hill resident Jeremy Harris, who attended the vigil. Many vigil participants were members of other faiths who came to show solidarity with the Jewish community. Barbara Singer, who attended the gathering, said she was moved by the outpouring of prayers and support. “What warmed my heart was people from every walk of life and every nationality and every religion were here,” she said. Many groups came together to make this vigil possible, including members of Congregation Beth Israel and Temple Kol Ami in Scottsdale, Temple Solel of Paradise Valley, Temple Chai in Phoenix and Temple Emanuel of Tempe. Guests bowed their heads and closed their eyes as Jewish leaders led prayers throughout the night. Rabbi Mari Chernow took the podium, acknowledging the fear of evil through the teaching of psalms. 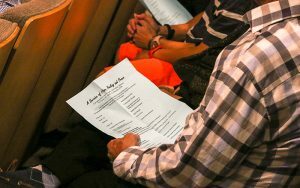 Guests sang along to the traditional songs of remembrance of those who were murdered and for the victims recovering from injuries. Michelle Phillips, who is originally from England but lives in the Valley, believes positive action is needed to help the Jewish community feel safe again. CORRECTION: A previous version of this story erroneously said one of the 11 victims of the Tree of Life Synagogue shooting was a survivor of the Holocaust. The error occurred in the fourth paragraph of the original. The story has been corrected, but clients who used earlier versions are asked to run the correction that can be found here.